Horse care is expensive, and some of the expenses can't be avoided. But when it comes to cleaning and conditioning your equine pal's mane, you don't have to make a special run to the horse supplies store and pay a pretty penny for a product that will make her look her best. Some common household items are less expensive and more natural than commercial products, and will do a great job, either alone or in a mixture. For optimal results, it's important to clean and prepare your horse's mane before you apply a conditioner. A baking soda paste, made by mixing 1 part baking soda with 3 parts water, will remove buildup of previous products you've used on your pal's mane, and will get rid of dirt and debris your horse picked up out in the pasture. Leave the mix on for a few minutes before rinsing, and the mane is ready for some deep conditioning. Mineral oil adds a lustrous shine to hair by locking in moisture and stopping frizz. Perhaps the easiest of products to use, it requires no mixing or preparation. 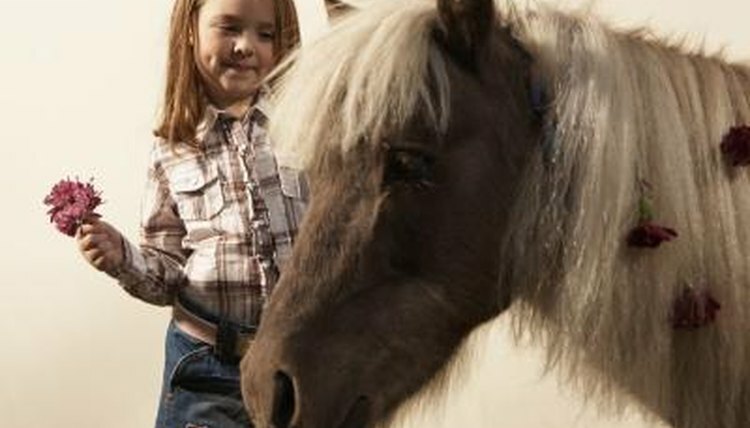 Simply massage the light oil into the damp mane, and discover how easily knots and tangles are released. When you use mineral oil sparingly, rinsing isn’t necessary. You can use vinegar to remove stains of all kinds while getting rid of tangles. Try adding a dash or two of white vinegar to a one-to-one mix of your own hair conditioner and water for added shine and manageability. There's no need to rinse; just leave the mix in the mane to repel dirt and dust. For stubborn stains, pour a mix of equal parts water and white vinegar into the mane, let it sit for a few minutes, then rinse. The smell may be a bit harsh to your nose, but white vinegar often is used as ingredient in homemade fly sprays. Not only will your horse look beautiful, she’ll be happy and fly-free, too. Raw eggs are great hair conditioners, whether used alone or in a mix of other ingredients. They contain proteins and fats that moisturize, lecithin for strengthening, and enzymes that remove oils, all of which make the egg one of the most useful items in your kitchen for conditioning your horse's mane. For the simplest application, beat some eggs together, apply the mix to the mane, leave it in for 20 minutes, then rinse with cold water and shampoo. Add rosemary essential oil to the beaten eggs for extra strength and growth stimulation. The Scope of Mineral Oil in Personal Care Products and its Role in Cosmetic Formulation; David S. Morrison, et al. Raised in rural Illinois, Susan Russell has been around animals of all kinds her entire life. She began training horses at a young age and went on to receive a B.S. in animal science from Southern Illinois University, where she specialized in equine science.